﻿ Time to Give a Dam: Alternative Energy as Source of Cooperation or Conflict? Time to Give a Dam: Alternative Energy as Source of Cooperation or Conflict? Mitigation can be a means to peace, not just conflict, said Stacy VanDeveer in the lead up to Backdraft: The Conflict Potential of Climate Mitigation and Adaptation at the Woodrow Wilson Center on June 10. VanDeveer believes that mitigation techniques, particularly alternative energy sources like hydroelectric dams, could stimulate cooperation rather than exacerbate threats. As shown by Aaron Wolf’s Transboundary Freshwater Dispute Database, cooperation over water is much more commonplace than conflict – over the last 50 years, only 37 disputes resulted in violence, and 30 of those occurred between Israel and one of its neighbors. It thus stands to reason that water could continue to serve as a unifier when it comes to hydroelectric development. Neighboring countries sharing a major water basin undoubtedly share a common interest in managing this nebulous resource jointly for economic and environmental gain. However, various examples from around the world complicate this assumption – the Rogan hydroelectric dam in Tajikistan worries downstream neighbor Uzbekistan; India’s recently built hydroelectric dam in Kashmir stymies water flow and dries up irrigation canals in Pakistan; and Kenya worries about Lake Turkana’s ecosystem as Ethiopia moves to construct a new hydroelectric dam. The list goes on. One prominent South American example is a particularly apt case in point. In 1973, Paraguay and Brazil signed a bilateral agreement to build the Itaipu hydroelectric dam, which at that time was the world’s largest. After 20 years of construction that carried a hefty price tag of US$15 billion, Itaipu now provides some 26,000 megawatts of energy to Brazil and Paraguay. From the outset, however, tension between the two countries has outweighed any tangible benefits. Paraguay complains that although it relies on the dam for 90 percent of the country’s electricity, it uses only a fraction of the dam’s output – 10 percent to be exact. Meanwhile, Itaipu accounts for 20 percent of Brazil’s total energy needs. Fueling tensions further, the terms of the original 1973 treaty dictate that if one country has surplus energy, it must sell that energy to the other for below-market value; meaning Paraguay regularly sells Brazil leftover energy at cutthroat prices. Paraguay argues that if they were allowed to sell to third-party customers at market value, the country would be making upwards of US$2.28 billion a year – or, in other words, double the sum paid by Brazil for 18 years of power imports, according to the Asunción press. Cooperation and Compensation Win the Day? After more than 30 years of increasing hostility, Brazil agreed to triple its compensation to Paraguay in July 2009, increasing its annual payments for dam energy from US$120 million to US$360 million. Paraguay also won the possibility of selling excess energy produced from the dam to the private Brazilian market, although Paraguay will not be allowed to sell to other countries until 2023. However, the cooperative atmosphere did not last long. Despite the deal and warming relations, Brazil chose to flex its military might in a November 15, 2009, training exercise dubbed “Operation Lasso,” which took place on the border of Argentina and Paraguay. The mission: quell violence in a hypothetical enemy country and recover a bi-national hydroelectric dam that had fallen into their hands. 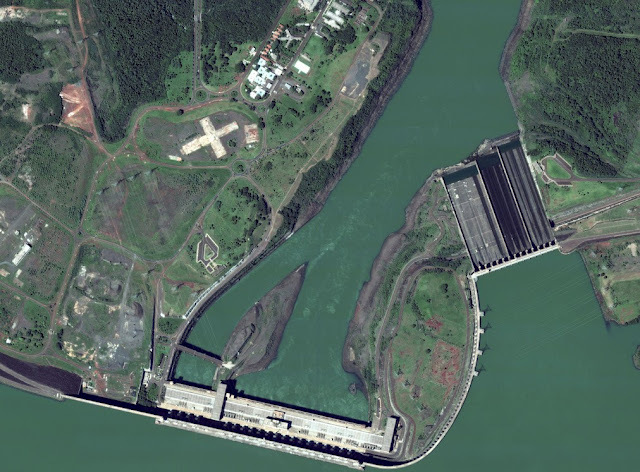 The complicated nature of Brazilian-Paraguayan cooperation over the Itaipu dam will continue to be tested, as energy demand is set to significantly increase in the near future. The 2014 World Cup and 2016 Olympic Games will both take place in Brazil, and the expected influx of tourists and athletes, as well as the construction of major Games-related infrastructure projects, will surely put added strain on its already fragile energy infrastructure. With Paraguay already so dependent on Itaipu – a brief blackout in 2009 caused the entire country to lose power for 15 minutes – tensions over energy sharing will undoubtedly reoccur. Sources: ABCTV (Paraguay), BBC News, Brazilian Southern Command, Brazzil Mag, Dawn, Diplomatic Courier, Defesa@Net, Jaluo Africa, MercoPress, Oregon State University, United Nations, United Press International. Photo Credit: “Satellite image of Itaipu Dam, Parana River, Brazil/Paraguay Border,” courtesy of flickr user DigitalGlobe-Imagery. Yet another example of the security implications of hydroelectricity headlined the news today: "Attack by insurgents at Russian plant owned by RusHydro, the world's second largest hydroelectric power producer, leaves two dead and two injured." Good post Kayly. One question: how are hydro facilities more vulnerable than their non-renewable counterparts? Great question. I don't necessarily think that hydro facilities are more vulnerable than their non-renewable counterparts. I do, however, think that many factors need to be taken into account before we invest heavily into more hydroelectric infrastructure in the U.S. and elsewhere. We must remember geographic, historical, cultural, and resource constraints before pushing for hydro as the next renewable energy answer. Although hydro should undoubtedly be a part of our future energy mix, we need to acknowledge possible backlashes before going forward. Both renewable and nonrenewable energy sources are equally vulnerable to insurgent style attacks, but what of the danger of conventional style attacks or protracted warfare. Specifically in the case of the Itaipu dam? It seems in this case we have a distinctly different security situation than what is seen in the case of the Russian dam mentioned previously in this thread. Is this equally as dangerous or more or less so? Kayly you bring some good points to the table. A large problem with the shared facilities is the manning/operation of the dams themselves. With two friendly countries this could be an easy agreement, but involving two hostile countries, India/Pakistan for instance, the issue gets far more complicated. If a conflict broke out and India had control over Pakistan's water supply it would be devastating for the Pakistani population. But that point itself is why I think that further work needs to be done on this. If we could prevent such a tragedy that would be a major victory. And if like the post says, the two nations could rally around cooperation for this project it could provide for eased tensions and possibly even an end to the conflict. Although, very easy to say, much much harder to do. Thank you, everyone, for your comments. Anon., I do not claim to be an expert on insurgency or protracted warfare (though Itaipu strikes me as a particular example of how "conflict" has a more nebulous definition than most traditionally see it, and the tensions between Brazil and Paraguay are in every way "protracted"); instead, I'd like to direct you to another resource that may be of better use: Small Wars Journal is a good resource for hydroelectric dam's context in war settings, though more specifically in Afghanistan and Iraq. As for you, Eric, I leave you with our Asia Program's publication "Running on Empty", which gives us a greater sense of Pakistan's water woes. As you will read, Pakistan has enough obstacles to overcome when it comes to sanitation, governance, and supply. Throwing another wrench in this equation, say, India building a dam that threatens supply further, would only exacerbate existing hostilities. International Rivers released a special issue on rivers, water, and climate in September, which specifically focused on "risks associated with building dams at a time when we can't predict either high or low flows." Of particular interest to readers may be the article "Tensions run high in Brazil as Amazon Indians take over a dam site after their ancestral graveyard is dynamited for the project." It would seem a dam can cause one of two things if it affects a waterway that crosses international borders. 1) the states that share the waterway share the cost and benefit of the dam. 2) The dam is built with the purpose of benefiting only one of the states the waterway touches. In the second case, an international conflict could result. Take the Nile for example, its headwaters are not in Egypt, curretnly Egypt benefits most from the Nile. If the Sudan or Ethiopia were to build a dam they could potentially destroy the economic usefulness of the Nile for Egypt. The result would be a powder keg and almost certainly conflict would result. Good thoughts, David. It is true that Egyptian President Anwar Sadat once famously said that "the only matter that could take Egypt to war again is water." However, past experience has shown us that cooperation rather than conflict has been the story of the Nile and its riparian states. Patricia Kameri-Mbote, of Strathmore University, Kenya, noted in a recent Navigating for Peace brief "Water, Conflict, and Cooperation: Lessons from the Nile River Basin" that although the potential for cooperation is high, a few key steps should be taken in order to maintain peace. Namely, the engagement of non-state actors (such as farmers, fishers, women’s groups, and community based organizations) to find cooperative solutions to potential water conflicts; the development of the capacity of civil society groups to ensure meaningful contributions to basin-wide initiatives; and the coordination of efforts of bilateral and multilateral funding institutions operating in the basin in order to realize synergies and engender cooperation over water. The Columbia River which is shared by the United States and Canada is another example of a place where Dam's create cooperation. It raises the question of what factors help to create this cooperation between states which promotes international cooperation with regards to water resources? Can these factors from this instance carry over to shatterbelt regions such as Southwest Asia and be used to promote cooperation there or in other regions suffering from perenial conflict? Thanks, David. The U.S. and Canada have a storied history of good relations, not just in regards to water resources, but also economically and politically. This is more rule rather than exception, especially when it comes to neighboring countries with similar cultures and values and good governance and infrastructure. Unfortunately, many of the "shatterbelt regions" like South/Southwest Asia are rife with underlying tensions that make good neighbor relations more complicated. Take India and Pakistan, for example. They have always struggled with border disputes, unevenly shared water resources, and clashing ideologies. It's hard to imagine joint water resource management as a quick fix, especially as tensions continue to simmer over the Indus river basin. However, in other conflict zones traditionally thought of as lost causes, there are more innovative approaches that seek to build peace through cooperation. Friends of the Earth Middle East have proven that even in the most contentious of regions, Israel and Palestine, the environment can be used as peacemaker. Hopefully, this model can be applied to other regions. All about the strength of the institutions and the rate of change. Can they institutions negotiate cooperation and handle rates of change that enable them to adapt in time. The threat of conflict comes into sharper relief when rates exceed our institutional ability to adapt.